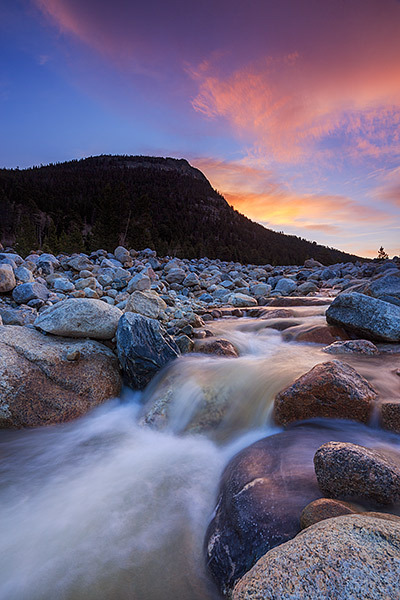 Pastel colors light the sky over Bighorn Mountain and the Roaring River near Horseshoe Park. This image take below the Alluvial Fan is one that did not exisit prior to September, 2013. The flooding that ravaged Rocky Mountain National Park as well as Estes Park caused the Roaring River to run a new course. The Roaring River now runs east to west for a quarter of a mile or so where it used to run north to south. This newly created course the Roaring River now takes has opened up new opportunities and views that did not exsist prior to 2013. So after all the fury and hardship the September, 2013 flooding caused there are still reasons to be grateful and look for silver linings. Photo © copyright by Thomas Mangan.